Undergraduate student at Tulane University. Pursuing a major in English and International Development with a minor in Painting. I think I speak on behalf of most of the class in noting that this was my first exposure to ICT4D. I don’t consider myself a tech-y person (I must admit I even struggled to navigate around the new blackboard page at the onset of the course), but as I browse through the blog and Twitter page, I am impressed by the how much we have explored–both in an individual and collective sense. As many of my peers/fellow bloggers have noted in their reflective posts, it has become a concern to focus on not just what projects are implemented, but why and how. As I browse through our reading list for the course on Blackboard, I am impressed by just how much we were able to cover. ICT4D is a multifarious and dynamic field. I think many of the most salient lessons to be learned reflect ways in which the ICT4D field can be managed and improved. This has concurrently prompted me to consider the field of development at large. We have talked about infrastructure a great deal in this course, and a repeated pitfall of development projects is that infrastructural barriers undermine larger development goals. There are many lessons to be learned from ICT4D, and many of these lessons can be applied to other development classes. While I have encountered a degree of concern pertaining to the way the IDEV curriculum is managed here at Tulane, I do see the relevance of this class, as ICT has, and will continue to shape the world. As Coby mentioned in his own post, we learn by doing—blogging, tweeting, and mapping, prompted us to new challenges while concurrently allowing us to assert ourselves in the field and witness/participate in a valuable dialogue that exists on the web. When we first started blogging, I must confess that I struggled to find resources. Tweeting prompted me to see all the information bouncing around on the internet, and explore the compelling voices of many of the members of the ICT field. For instance, the week we explored Linda Raftree’s work (The Field [formerly known as?] ICT4D is messy) opened my eyes to the larger debate. As we explore her intricate and dense post, we are prompted to consider an overflow of opinions. I think the discussion that followed in the wake of Hersman’s ‘blog bomb’ was productive and dynamic. There are many challenges to consider in the context of ICT4D-and this we are all acutely aware. We had the opportunity to explore specific challenges in the context of our specific counties, deepening our understanding and relationship to issues that can at time seem too large to grapple with. In all development projects, understanding the target group is key. It is also is key to see ICT4D t not as a quick fix for development projects, but as an opportunity to reevaluate the system of aid. ICT projects commonly fail because of lacking communication between project organizers and the target group, and understanding from both sides would make projects more successful. This is itself is a large goal. The HCD toolkit reaffirms the idea that the need for better communication is essential; both sides must fully understand what the project is intending to accomplish and what can be expected of it. Another challenge is showing how the Internet can be a tool for development in various developing contexts of the world. In their work, Can One Laptop Per Child Save the World’s Poor, Warschauer and Ames articulate that the OLPS deployments that simply tried to hand out laptops have failed because they ignored local contexts and discounted the importance of social, as well as technical support and training. This seems to reflect a larger pattern in technology and development, in which new technologies generate excitement and optimism to be eventually deconstructed by disappointing realities; according to Warschuer and Ames. “it is not the computer that brings benefit, “but rather the social and technical support that surrounds the computer that makes the difference VOA’s focus on the training component reflects a fortunate contrast from the failures of OLPS. I think this is important to reflect upon. ICTs have the power to change the way we practice development throughout the world. I am very interested in further exploring barriers to access. Information is a tool and access to information is a process for building self-reliance, empowerment, civil society, participation and gender equality. Helpful and more current review of Kenya’s ICT Sector: Timothy Waema, Catherine Adeya, and Margaret Nyambura Ndung’u. Kenya ICT Sector Performance Review. 2009/2010. The Networked Readiness Index 2010-2011. The Global Information Technology Report 2010-2011. World Economic Forum. ITU. International Telecommunication Union. Measuring the Information Society. 2010. Great article: Fengler 2012: How Kenya became a world leader for mobile money. For example, Fengler tells us that Kenya has more cell-phone subscriptions than adult citizens and more than 80% of those with a cell phone also use “mobile money” or “M-PESA.” I highly recommend doing some research pertaining to M-PESA. WSIS Stocktaking: Success Stories from the World Summit on the Information Society (this source offers some examples of development projects occurring in Kenya. Example: The project, ‘Reaching out to Rural Africa,’ involved installation of Rural Internet Kiosks, and then expanded to create a technological training program). Fortunately there is so much information about Kenya! Although Kenya suffers from low levels of ICT readiness “due to the underdevelopment of ICT infrastructure and the lack of a widespread skill base that would enable society to make an optimal use of technology” and “the cost of accessing technologies is still high for a large share of the population.” Infrastructure is central in achieving the goal of digital inclusion. I wish you happy researching and learning! This past Tuesday, Adam Papendieck delivered a lecture to our class. By exploring emergent ICT trends influencing development, his presentation helped us to gain an understanding of key trends in ICT which are influencing/disrupting conventional development interactions today. It is essential that we are able to identify these common trends in various development sectors, and think about how they can be harnessed for innovation. A great deal of our discussion in this course has revolved around this goal as well–an I feel as though we are making considerable progress in understanding the multifarious implications of technology and development. While my classmate rwoolworth evaluates “How Social Media Can Make History” in his post for this week, I would like the explore a more critical view expressed by Evgeny Morozov (Adam Papendiek mentioned his name after mentioning that we should all check out Clay Shirky’s TEDtalk). It is valuable to compare the contrasting work of these two individuals. In his writing, The Net Delusion: The Dark Side of Internet Freedom, journalist and social commentator Evgeny Morozov contends that by falling for the supposedly democratizing nature of the Internet, ‘Western do-gooders’ may have missed how it also entrenches dictators, threatens dissidents, and makes it harder—not easier—to promote democracy. He assesses “digital diplomacy,” and thats that it requires just as much consideration as any other kind of diplomacy. I think it is worth considering this alternate view. According to Morozov shows why we must stop thinking of the Internet and social media as inherently liberating and why ambitious and seemingly noble initiatives like the promotion of “Internet freedom” might have disastrous implications for the future of democracy as a whole. Lee Siegel does an excellent review of Morozov’s work. Her work, Twitter Can’t Save You, touches on Morozov’s main arguments pertaining to the Internet’s political ramifications. This question is worth our consideration. The internet has become inextricable from democracy. So how can it be harnessed in a productive way? Another point to consider: both Twitter and Facebook have refused to join the Global Network Initiative, a pact that Morozov describes as “an industrywide pledge . . . to behave in accordance with the laws and standards covering the right to freedom of expression and privacy embedded in internationally recognized documents like the Universal Declaration of Human Rights.” (Morozov in Lee 2012). This week’s readings propel us on a multifarious journey, as we are to deconstruct a seemingly harmless four letter word—ICT4D. As we explore her intricate and dense post, The field [formerly known as?] ICT4D is messy, we are prompted to consider an overflow of opinions. I would like to focus on the work of Wayan Vota in particular, as he picks apart the “blog bomb” Erik Hersman dropped on the scene a little over a year ago. (His work is entitled, The Challenge of Defining ICT4D Or Why Erik Hersman is ICT4$). After exposing his initial reactions to Hersman’s work, (frustration–>a state of productive reflection), Vota prompts an important question. How would ICT4D look to the average African? And how to we ensure that “ICT4D” carries benefits to those who need it most? In considering these questions, we must reflect upon the similarities and differences between ICT4D and ICT4$. According to Vota: (1) ICT4D and ICT4$ are two who different industries, (2) Projects can be ICT4D and ICT4$, and (2) ICT4D and ICT4$ should be symbiotic. When we look at the Tech start up world, ICT is seen a means to make money. We have explored the success of such pursuits such as M-Pesa (which are intended to be sold at a profit to venture capitalists and people under served by the market place). I cannot help but think back to the overly smily M-Pesa video we watched in class. But even though the aim is financial, the intention doesn’t undermine the positive effects the program is having in the context of Kenya. But if we move to consider the international development world, ICT is used to deliver services such as healthcare and education at very low costs to those under-served by the government. Impact is the focus. But as we have seen, this more altruistic (and less capitalistic) aim doesn’t always succeed. Many of the projects we have explored in the course are failures and there are endless lessons to be learned. As Vota so clearly outlines, projects can be a combination of ICT4D and ICT4$ and neither one is perfect. Vota counters Hersman’s claim that we need to focus more on ICT4$, although he contends that focusing on financial sustainability is key. And when sustainability does not occur, we should celebrate failure. It is difficult to find the balance between development and business goals. So do we side with Hersman’s cynicism and think less of ICT as something that’s about development? Is it right to focus on ICT4$ > ICT4D? It is readily apparent that Hersman’s ‘blog bomb’ has successfully disseminated a wide-range of responses. This discourse is critical in the ICT4D field. As we explored through our reading of Opening Closed Regimes; What Was the Role of Social Media During the Arab Spring? YouTube became a particularly important tool for spreading news and information of Egypt’s uprising the form of user-generated videos around the world. Research conducted through this work identifies the top viral videos as of June 2011. While it is difficult to quantify the exact impact of these videos on audiences, it can be seen that some images of suffering would have prompted protests and spurred protests and heightened moral outrage. After reading about the effect of these videos, I thought it might be interesting to explore some of the videos, as the article provides an appendix. Since January 27, 2011 the video has received over 2,450,037 views (about 300,000 more since the publication of the article). Important message to youtube and people who flag this video: If it gets flagged or removed , it will be uploaded 10 more times. I found this somewhat threatening tone unique in the context of YouTube. The video intends to be taken seriously and capitalizes on the right of expression. The video contains powerful imagery, which is bolstered by the incorporation of sound. While the content is heavy, it is relatively easy to follow. It is laden with symbolism and the accessibility through YouTube helps reveal the way in which such a video is seen as a success. In order to draw a contrast across cultural contexts, I thought it would be interesting to look at the use of YouTube in our own county. Internet campaigns are changing the face of politics. According to Claire Caine Miller’s work. How Obama’s Internet Campaign Changed Politics, Mr. Obama’s 2008 campaign utilized YouTube for free advertising. Videos were seen as more effective than TV ads because viewers had chosen to watch them or had received them from a friend (via email) instead of having a TV show interrupted. As we have all seen in the recent campaign ICTs have played an increasingly more important role. Social media platforms we have explored in class such as Facebook, Twitter and YouTube are growing rapidly as a source of political news. According to Journalism.org, the number of Americans who say they regularly go to these destinations to learn about the campaign has doubled since January of this year. Even with that increase, however, these leading social media platforms are still turned to by a relatively limited number of Americans, about 17% in all, when those who mentioned at least one of those platforms are combined. The link between politics, governance, and YouTube is reshaping our world and the power of tools such as YouTube cannot be underestimated in the context of the developing world. E-Waste: Where Do Obsolete Technologies Go to Die? But we also must consider the role of many countries in the developing world, which have become recipients of obsolete electronics and hazardous materials, as shown in the picture below. According to BiztechAfrica, In 2011, 178 countries have agreed to accelerate a ban on the export and dumping of hazardous waste in developing countries. 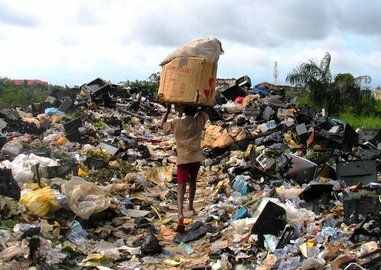 This included many countries in Africa, which have become dumping grounds for obsolete products. I can’t help but wonder what we can do, and what is being done. I found two great examples of successful and innovative projects from this article, where Sarah Pouzevera asks: What are the consequences of new technologies on the environment, and how can we act responsibly, starting now? In Egypt’s Manshiyat Naser district, also known as “Garbage City”, girls come one day per week to learn how to turn trash into income. They work with a teacher to break down non-working computers that have been donated or collected by the local garbage collectors and rebuild them into working computers. These computers sell for around $300 on the local market. Half of the proceeds go directly to the girls, and the other half goes to funding the warehouse facilities and trainers. The parts that cannot be repurposed into a new computer are sorted for recycling- including the valuable gold and silver of microprocessors, motherboards and circuit boards (Pouzevera). However, I was disheartened when I tried to learn more about this program, as I could not locate any more information. But the situation of trash in Cairo is a huge infrastructural barrier to the development of the nation, as there is not even a government led waste-pick-up program through the country. According to Pouzevera, “Kenya is emerging as one of the leaders in e-waste management, having convened The National Stakeholders Workshop on Waste of Electrical and Electronic Equipment e-Waste Nairobi 2010.” Kenya is also one of the first African countries to implement a government-led e-waste policy and strategy. Computers for Schools Kenya(CFSK) a non-governmental organization, “dismantles computers into metals, wires, plastic, aluminum, copper, monitors and electronic boards which are then sold separately”. The monitors are also converted into TV sets after its boards are replaced with those of televisions. I think these examples raise a separate subset of issues related to ICTs and development that we have not yet discussed in class at length. A lot of questions are raised as we consider how the issue of trash should be addressed. According to a new World Bank study, 75% of the plantet’s population now has access to mobile phones. As we have explored through various reports in this class, phones are used in myriad ways. Health and financial services are becoming inextricable from mobile phone technology, and the impact is being seen through employment and government sectors. While this study encapsulates a great deal of information, I would like to focus on something we have not directly covered in class–employment and the role for government involvement. According the this study (Information and Communications for Development 2012), the mobile phone industry has become a major source of employment opportunities on both the supply and demand side (Kelly and Minges pg. 8). Interestingly, one chapter of the work is focused on something referred to as business incubators or mobile labs (mLabs) for supporting entrepreneurial activity in the mobile industry, as well as new economic opportunities related to trading goods and services that exist only online. In an interest to learn more about this concept I found this site : mLab Southern Africa. MLab Southern Africa is classified as a “mobile solutions laboratory and startup accelerator” which provides entrepreneurs and mobile developers with the tools they need to develop innovative mobile applications and services. They work to build a sustainable technology business that will meet the demands of a growing base of mobile consumers in Africa and around the world. We are witnessing an entire new app economy develop! According to the aforementioned study, more than 30 billion “apps,” were downloaded in 2011 –“software that extends the capabilities of phones, for instance to become mobile wallets, navigational aids, or price comparison tools” (World Bank). As we have seen, new apps reshape and create new livelihoods for many individuals in the developing world–the very creators of that technology reflect a new economic sector. If the larger goal at hand is to empower the poor, it can be seen that mobile phones are a critical platform for unleashing tools and services. But these platforms are problematized by cost, control, and barriers to innovation. Those of us who are excited about opportunities for technology and development (and all these new Apps we have investigated) must recognize the tensions presented by any combination of technologies and social, governmental, and economic structures.